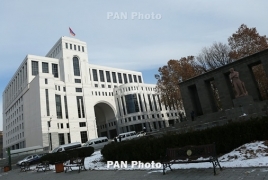 PanARMENIAN.Net - International partners should demonstrate more respect and sensitivity towards the Armenian society, Foreign Ministry spokeswoman Anna Naghdalyan said Wednesday, April 10. "We are aware of these statements, which express concern over the discussions taking place in public life of Armenia, while referring to the international commitments of Armenia," Naghdalyan said. "The Government of the Republic of Armenia fully adheres to its commitments to protect and promote human rights. The nonviolent democratic revolution, which took place in Armenia, is the best evidence that human rights, generally, are effectively protected if they become part of a social consensus and are perceived as universal social and moral values. "Therefore, in this context, our international partners should demonstrate more respect and sensitivity towards the Armenian society and refrain from undue engagement in the public debate, even if they disagree with its tonality. "We would like to remind that the principle of public morality is a part of international commitments on human rights and can not be ignored. "For its part, the authorities of the Republic of Armenia will not tolerate any illegal actions and will continue to protect the constitutional rights of all citizens."